Avocado slices. Covered in breading and served with ranch dipping sauce. 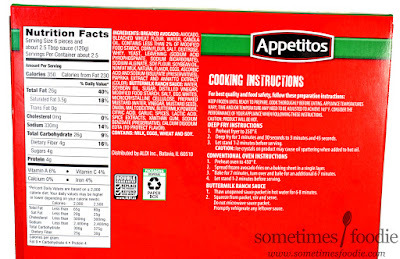 You're not fooling anyone Appetitos. 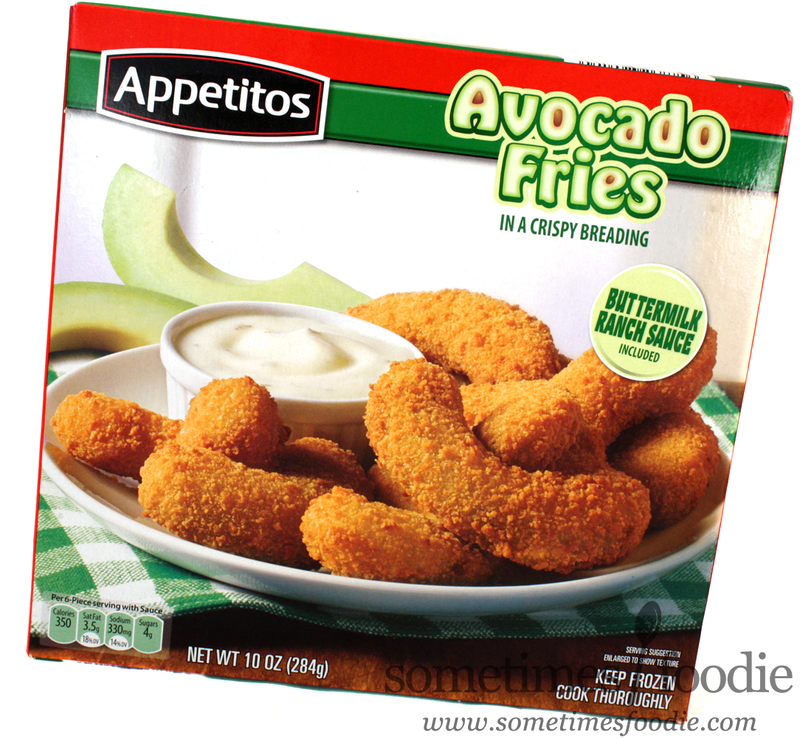 Just because it's avocado doesn't mean this is healthier than breaded anything else...but I am curious as to how this will work out. Taking vegetables and turning them into "fries" isn't a new concept, companies and restaurant chains have been doing this with green beans for years, but avocado slices? They're so soft and creamy. Can they even hold their shape for dipping? Time to investigate! The box is ugly. There's no sugar coating that. We have a garish bright red color with a green band and some really questionable typeface choices. The food imagery on the front of the box is it's only point of redemption, and if you flip it over the back is even worse than the front. This looks like some kind of cheap Christmas product, but it's meant to be a cool hip variation on veggie fries. I love Aldi, but this? This is pretty darn bad. Once your eyes stop bleeding from the bright red and white contrast on the back panel, the instructions give you a two options for heating this up, deep fryer, and oven-baked. I decided to go with the oven baked, which is easier, less messy, and a little healthier. It's my go-to method for cooking frozen foods. I opened the box, spread the frozen avocado fries out on a baking sheet, which look like breaded Cheetos, and followed the baking instructions while the frozen sauce packet thawed in the sink. A few minutes later everything was crispy and creamy, so I transferred it to a plate and took it over to my photo set-up for it's close-up. Not too appealing looking, is it? The "fries" were really inconsistently sized. 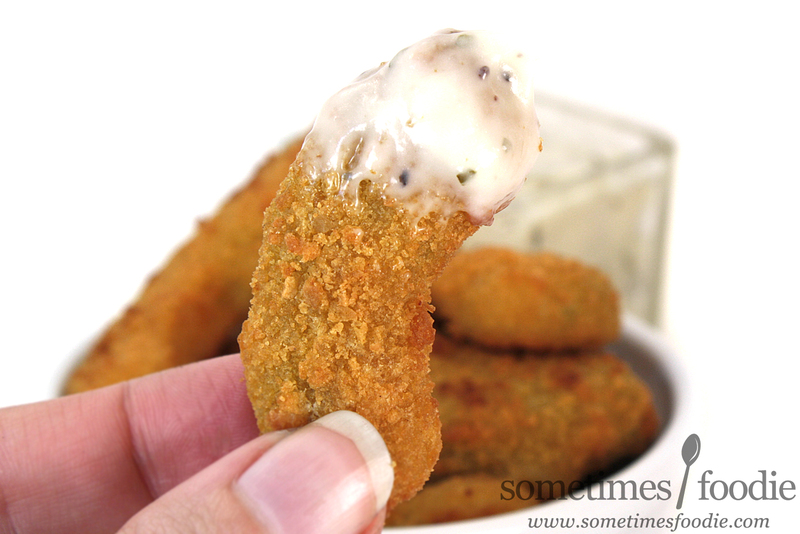 Some looked like itty bitty popcorn shrimp, while others looked like chicken fingers. As soon as I set everything up I realized that this is either WAY too much dipping sauce, or not enough product. What you see in this photo is the entire contents of the box baked up served with 80% of the ranch sauce that was included for dipping. After I filled this snazzy glass container there was STILL some left in the pouch. 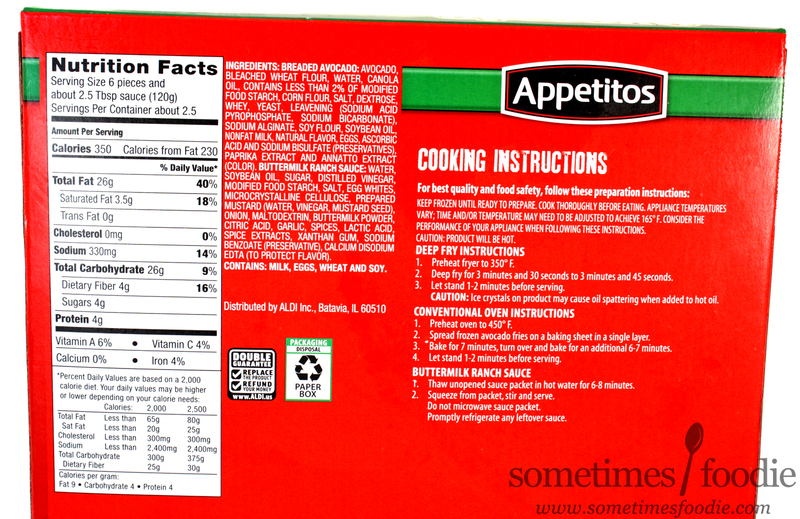 I love dipping and sauces just as much as the rest of you, but unless you are eating spoonfuls of this stuff with every bite...this ratio is way off. It's texture is thicker, like mayonnaise or those fancy salad dressings you buy in the refrigerated section that come in a jar, so dipping these delicate "fries" resulted in a bit of fry-breakage and breading-fall-out, but overall the fries were more structurally sound than I'd expected. The dip is bold and zesty, like a concentrated version of classic Ranch dressing, while the avocado fry tastes like...avocado. I mean, that's all this really is after all. No surprises there. 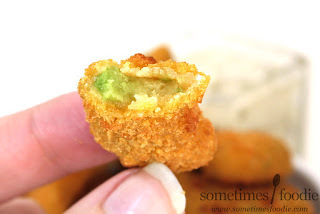 The veggie-interior is creamy, warm, and melts in your mouth with a generic breaded shell adding some much needed texture, but the overall flavoring is really bland and uninteresting. 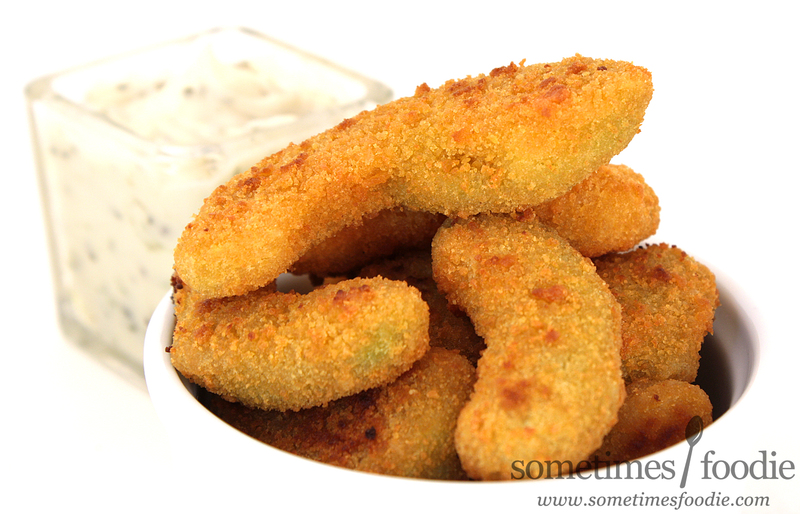 We're talking bland Shake-n'-Bake style avocado slices served with ranch. I prefer my avocado cold, preferably in guacamole-form, so eating it hot was really bizarre for me, and I didn't really care for it. I managed to eat all the fries, so it was pleasant enough, but I definitely wouldn't repurchase.